The Sanctuary at The Community Church is perfect setting for your wedding. The acoustics lend a superior tone to any music and our new, state of the art sound system* can provide for your mic, volume and recording needs. 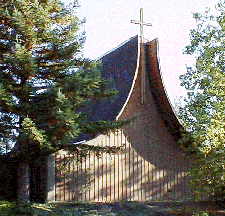 The sanctuary also boasts one of the finest pipe organs in the area as well as a finely tuned grand piano. A simple cross adorns the front of the altar and a stained glass window highlights the far wall. 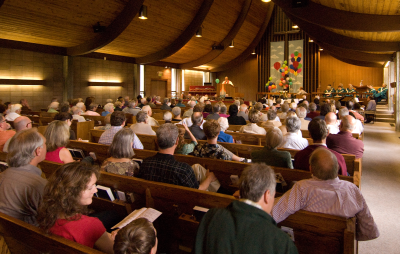 The Sanctuary seats 290 persons in our cushioned pews with room to set up additional 100 chairs. The Narthex provides a quiet entrance into the Sanctuary and is also used for smaller ceremonies. 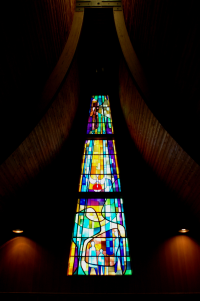 A smaller stained glass and a moveable baptismal font are opposite the large double door entryway. 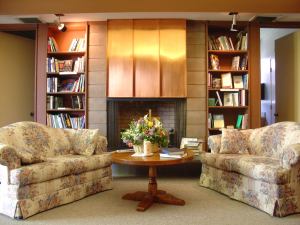 Adjacent to the Sanctuary is our Fireside Room that can provide a quiet gathering spot prior to your event. The Fireside Room has comfortable seating, a private bathroom, kitchenette and attached patio. The Fireside Room can be used as a dressing area for a bridal party and has a private entrance. *Our sound technician must be present to operate the sound equipment.